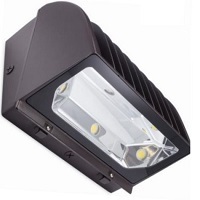 The LED Wall Pack from Jarvis Lighting is part of the AL series of All Packs. It is energy efficient providing energy saving by replacing to a 320 watt metal halide fixture. This wall pack could be use for flood lighting, area lightning, and sign lightning. The All Pack ships in its “dark sky” package but this can be reversed and put into the “forward throw” shape upon installation and known to be quick and easy. It lasts from 75,000 to 100,000 hours on average with a 5 year warranty. Plus it is DLC Premium approved.